How do I submit my printing job to the Print Shop? You can submit your job through our WebPrint job submission website at WebPrint or, if you have a blanket set up at the Print Shop, you have the ability to make charges that will be billed to your department at the end of each month. For personal jobs or off campus work you will receive an invoice. Where do I send my electronic file? All files that are not sent through the WebPrint job submission website should be emailed to the Print Shop. PDFs (portable document file) are the preferred file format. (WebPrint will convert your file to a PDF upon upload.) If you are sending your file to a specific individual in the Print Shop, please note their name in the subject line of your email. Can I submit the proof I received from the Graphic Arts Department to the Print Shop for printing? In most cases, no. Please check with the Graphic Arts Department to make sure your proof is a high quality PDF and has been fully processed. There are many steps that must be taken to make your file "print ready. "Most proofs are low quality to reduce file size for email purposes. Can I produce my own university letterhead, envelopes and business cards? No. 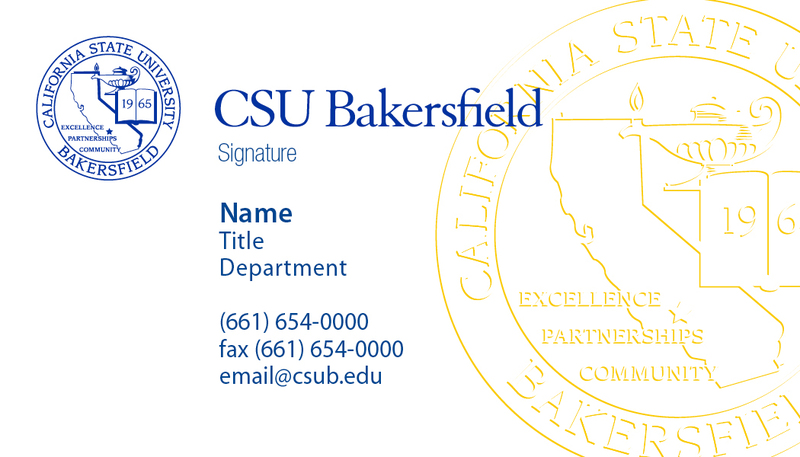 The university would like to maintain a unified look; all stationery (printed and electronic) is produced by the CSUB Reprographics Department. Which paper would be best for my job? It’s a good idea to know what kind of paper you’ll be printing on before you design your project, that way you can tailor your design to match the paper and finish. A sleek design might be best suited to a smooth paper while paper with a silk or matte finish might be better for a subtle theme. We would be happy to provide you with a free paper sample before you settle on one so you can get a feel for it. When printing in color it is not advisable to use a color paper. White paper is best for most applications, since color can be printed. What is the primary university logo? 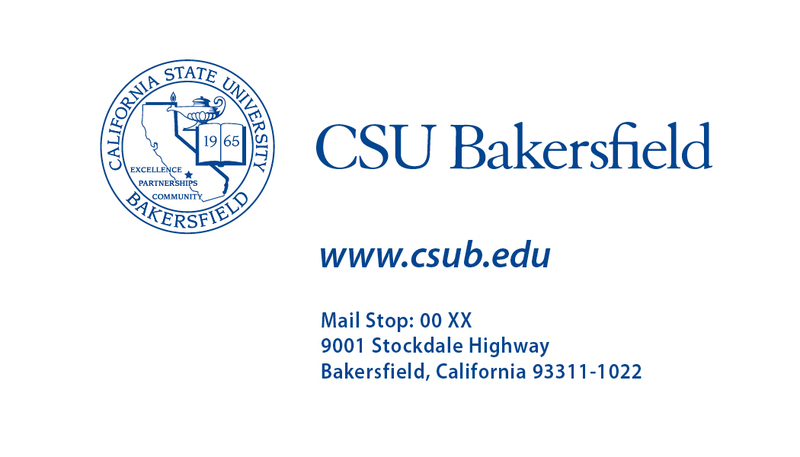 The logo is the university seal accompanied by the logotype "CSU Bakersfield." The seal and type should be blue, and the type portion cannot be used without the seal. There are color variations available for different design options. This logo should appear on all official communications. The logotype will always be proportionate to the seal and should not be scaled separately. The height of the seal should never be less than 5/8 inch. What is the commercial university logo? For advertising and promotional purposes, a more dynamic logo is available. The target audience and familiarity with the university should be considered when selecting the most appropriate option. 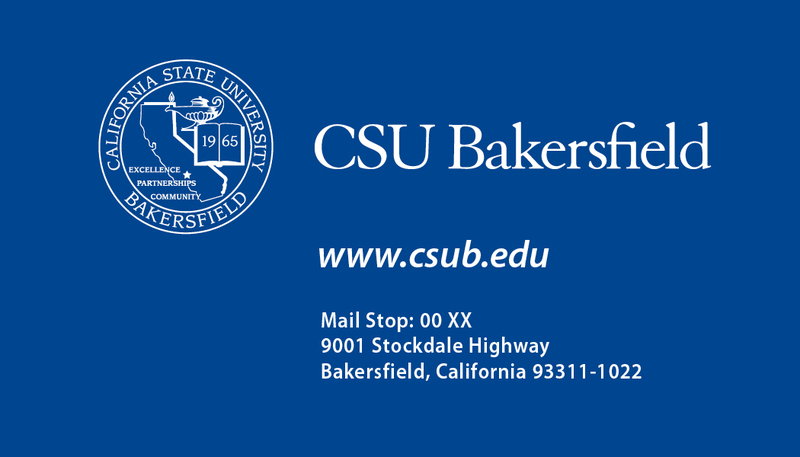 Can I change the color of the CSUB logos? Color options are very clearly defined and should not be altered in any way. The official university colors are Pantone Blue 286 C and Pantone Yellow 116 C. Refer to our page on CMYK color in the submissions section of our website. Your Identity Standards Manual offers a set of standards that utilizes regular graphic symbols to unite all university communications, including print, electronic, display, broadcast and web media formats. Many of your questions can be answered by reading the manual.